Sawcut filling in high traffic areas is a necessary investment to protect floor joints from significant impact damage. It is also a requirement in food storage and processing facilities to prevent bacterial growth and the intrusion of pests and contaminants through floor joints. Below are a number of factors to consider prior to proceeding with a joint filling program. Sawcut filling is used for two purposes: 1) As a flexible sealant: to seal joints from bacteria and other contaminants (eg: pharmaceutical, food processing, oil intrusion etc.) OR 2) As a semi-rigid load bearing filler: to protect joints from damage caused by scraping and impact (eg: forklift traffic). Pictured are two floor joints in the same dock area of a building which are 14′ apart. The unfilled joint clearly shows chipping and spalling along all of its edges whereas the filled joint shows only minor chipping. 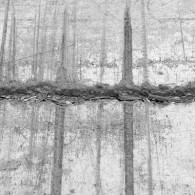 This is proof that the use of a proper joint fillers works to protect the concrete from damage. 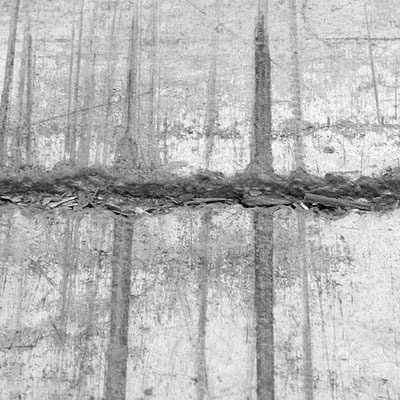 Sawcuts should only be filled after a sufficient amount of drying shrinkage has occurred, otherwise the joint filler materials will de-bond from the concrete and the joints will be unprotected (a complete waste of time and money). The time for concrete to dry and shrink fully can take more than one year. 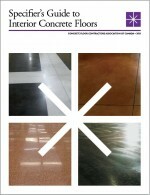 It has been found that a MINIMUM of 120 days of air drying at 20°C is required to maintain a good bond between the concrete and a load bearing joint filler material and a minimum of 75 days air drying at 20°C with an elastic sealant joint filler (the longer the drying time, the better). If you can wait longer, your investment will be better protected from failure due to this drying shrinkage. Some specifications are calling for the early installation of joint sealants and fillers before this drying period has elapsed. This creates many difficulties and is simply a waste of money. The complexities of returning to repair joint fillers in an operating environment are many — not the least of which is the owner having to pay for the same work to be done twice. The CFCAO urges you to either defer joint filling until the necessary drying period has elapsed, or to make sufficient allowances to install a temporary filler. Note: re-cutting of the joints may also be necessary to clean them sufficiently. Filler materials are manufactured in a variety of hardness’, expressed as a Shore “A” number (the higher the number, the harder the material). 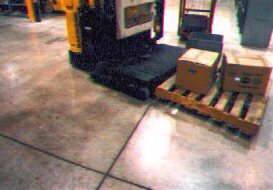 Joint fillers used as a flexible sealant may have Shore “A” values of between 25 to 35, but load bearing joint fillers for forklift environments MUST have a Shore “A” hardness of more than 75 (softer materials fail to protect the concrete from impact forces). Sawcuts may be filled to two depths: 1) 1/2″ deep on a backer rod for flexible sealants OR 2) full depth to the bottom of the sawcut for load bearing fillers. A 1/2″ deep filler is commonly used for foot traffic type environments. A full depth load bearing fillers are installed for the full depth of the joint so that they can not be displaced vertically under heavy forklift loads. 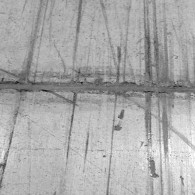 We recommend semi-annual inspection of floor joints to repair filler materials and fill joints in a timely manner before the edges become too spalled and need to be re-built.